We offer credit packages, monthly plans and custom pricing packages. - Made affordable. Perfect for small busnesses, like ours. I truly appreciate that, too, being I am paying out of pocket so that my boss dosen't reject the concept due to budget. 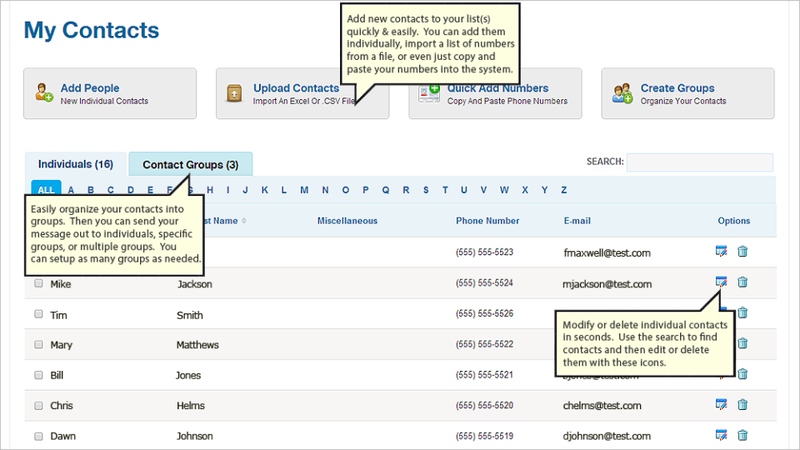 - When adding multiple phone numbers, it will not allow to duplicate a name, (what is up with that?) Nor, does it have the capacity to add duplicate phone numbers on the single contact. Overall: Thank you for the opportunity to share this with you. Good luck! Overall, great product. I am very happy with it. Pros: Taking advantage of the credits plan for text messages vs. a monthly service fee helps make it more affordable and apt to be used. It is a great program for small and medium size businesses to be able to sue with out the large overhead of some programs. Cons: When setting up the program it can at first be overwhelming. But if you take your time and follow the FAQ and think out what you need vs. want it s tarts to make sense and becomes easy to use. Overall: I have used several different programs at different cost and different companies. I have found that this one is by far the better fit for the needs we have for it. I can see where it can keep the staff and partners informed with a simple text blast as well as able to be setup as a good marketing tool for clients without spamming them either. 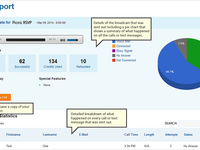 Pros: DialMyCalls is simple to use, it's fast and inexpensive. Unlike other companies, DialMyCalls requires no long term contracts, no large deposits or credit checks, and the simple instructions and ease of use allows you to use it when needed without having to locate instructions on how to send a blast email if you forget. Adding funds to your account when needed works well for us. Cons: More characters allowed would be a plus. Overall: Our firm uses DialMyCalls for inclement weather and emergency notices. We also use it as notification when one of our offices is closed. 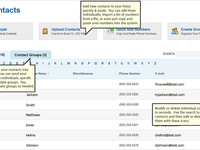 Prior to using DialMyCalls, we sent notices by email which may have been missed by many employees. Everyone receives and pays attention to the texts and is aware of what's going on in real time. Cons: Nothing comes to mind. We have not experienced any issues. DialMyCalls is a great system to keep touch with everyone in multiple networks! Pros: DialMyCalls is very cost effective all while having the ability to send mass phone calls, texts, and emails to multiple contact groups quickly. Cons: The app needs some updating as far as the overall user interface and ease of use. When searching for contacts you can only see 10 at a time and when you have a group of 1,000 and are not able to search for a specific person on the app it makes it time consuming to look up information. Pros: I don't think our group could function effectively without DialMyCalls. I remember what is was like years ago when we had ineffective and time consuming phone chains that took hours to accomplish what now takes minutes. We are so thankful for this company. Cons: Can't think of a thing. They keep the service current and customer service is excellent. Overall: we have used Dial My Calls to announce to our Kiwanis Club members the weekly meeting information for over probably 6 years. And its simple and quick to use for fast, emergency notifications. Pros: It is quick and easy to record a message and set up calls. The cost is very reasonable. There seems to be good customer support available, but I never needed it because the system was so easy. Cons: Setting up contact groups was a little confusing at first. Overall: We use DialMyCalls to contact clients of a volunteer tax preparation service. The calls remind clients of their appointment and what documents to bring. We have much less trouble with missed appointments and the clients are better prepared. Pros: easy to use from any device; speed of calling; customer service. Overall: Went from a slow single-call calling systems to online system which calls and texts messages as soon as we hit send. We love it! Amazing .... wasn't sure at first but after my 1st use --- WOW!! Pros: Very easy to use. When I had a questions, customer service was right there for me. Always adding new features to make our job easier. Cons: Haven't found a reason to not like this software. Overall: Saves so much time and employee cost in making the calls that had to be made to many prospects. Overall: Positive since day one. Quick response to questions. Also liked how you could test the software before spending money. Pros: You can build groups to select a circle of volunteers with one click. New contacts are easy to add. Cons: The phone ap is difficult to use on the road. This can be overcome by planning when a laptop is available to set everything up except the message. Overall: I use DialMyCalls for our Church and its ministries. It is a necessity for our food pantry which depends on rallying volunteers to unload our supply truck and preparing for community distribution. In weather situations such as bad weather cancellations, alerts can be recorded and distributed in five minutes. Cost is negligible. A great bargain for any Church who needs to contact circles of volunteers. Pros: The things we like most about this software is it ease of use, price points, and the ability to both use the app on our phones or the website on the computer to communicate with our audience. Cons: The only negative thing that we could comment on is the need to completely block a person in the group if we need to send a message concerning that persons family or loved one. Overall: We use this software to communicate things such as health updates, church reminders, and emergency alerts for our church family. We have found it to be one of the best services we could have ever invested in as a church. Pros: Where do I start? I love all of the features this system offers such as different groups for contacts, multiple ways to record, various options to purchase credits, automated opt out recording, text messaging options, and the list goes on! Cons: The only thing I dislike is the functionality of the app. It could be updated to have a better user interface and better efficiency. Overall: We are able to send out mass alerts when something needs to be changed and have benefited by keeping everyone connected. Pros: It's very simple to use and easy to train others to use it. For all the times that we've used it the job was done perfectly every time. We use it for snow and other emergency notifications to employees so reliability is critical. Cons: There is nothing that I can think of that I dislike. 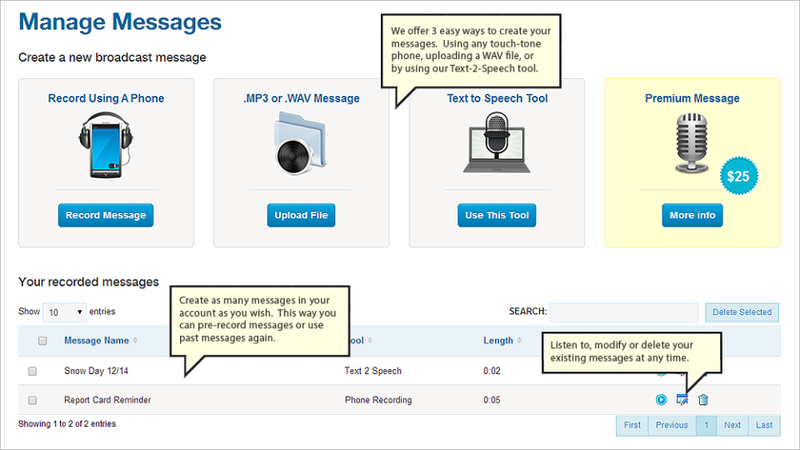 Pros: Easy to use with lots of different communication options--voice, email & text! Cons: Not as easy to export lists to ther services. Overall: Awesome service for those wanting to communicate and impact large and different groups of people. Pros: I like that the software is pretty easy to use and works really well. This week we had a lot of snow and sent a message to members that church service was moved from Sunday to Friday. We wouldn't have been able to accomplish the date change without the software. Cons: It makes it a little difficult to reach older members who don't answer phone numbers they don't recognize. Pros: The quickness with which I am able to verify that people received the call. Cons: In the section where you add a new contact, the phone number line was confusing. When you began typing the area code, several examples would pop up. if you selected one, it would enter the three digits in th box for area code and the next box, also. Would have to correct ie all the time. Overall: It has been great to send out a message and know that everyone involved got the same information, immediately. It has been a great asset to our communication. Pros: I can reach a multitude of customers in one call. I like that I can use my own voice and that the phone number displayed is my business line. Cons: For me I have to remove all my previous contacts and load new ones each time. Not to much of a big deal. Overall: I like that I don't have to call over hundreds of customers. This software save me time and hourly wages. You can split up your call list so you can handle whatever load you want. Also, you can set a time and day to send your message. This software is easy to set up and easy to use. The options for purchasing points is easy and has many options. 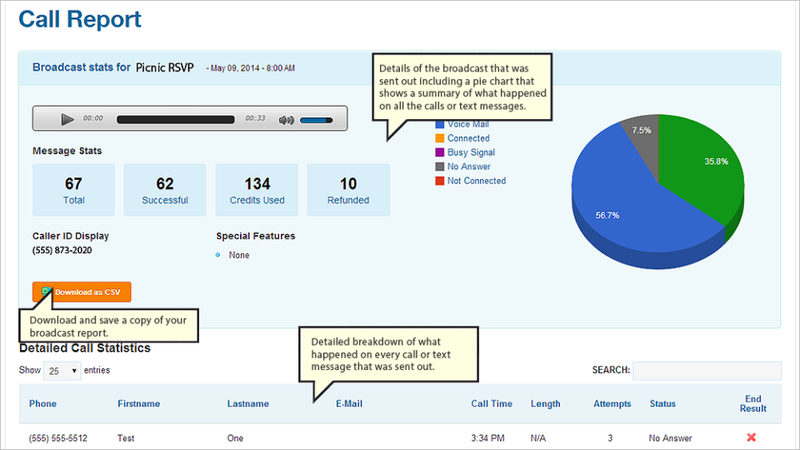 In addition you can review how many customers answered the phone and how many went to voice mail. Pros: We used this to send a text message to our list. it was very simple to use and you did not have to buy into a monthly plan. The options were cost effective. Wish they had covert voicemail but they don't, however they do have regular recorded calls they can blast out to your lists. Cons: message had a character limit costing you more for longer messages, making it difficult for us to fit our weblink which we had shortened. Also they don't have the ability to leave a vm on phone without the phone ringing. So had to buy another service SlyBroadcast for this ability. Makes Automated Calling a Snap! Cons: I have multiple locations, and for each one I have a separate account. It would be nice to have one umbrella account from which I could administrate all of my locations. Overall: DialMyCalls allows me to reach out quickly and efficiently to all of my customers, and in a cost-effective manner. I'm really happy with their product and pricing. Pros: I can, inexpensively, broadcast a message to all or a portion of the members of my organization in just a couple of minutes. This software saves me hours of phone calls and getting stuck in time consuming small talk when a member answers the phone. 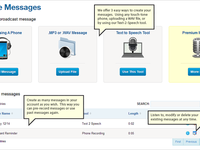 I love this software and recommend it to anyone in charge of communicating to members of a non-profit organization. Cons: I have no complaints about the software. I have no complaints about this software. Overall: Frequently, I need to remind members about an upcoming meeting or a change to a meeting time or location. Many of our members do not use email or texting, so the only solution is to call them. This saves me making 20 to 30 phone calls each month. Pros: This program has been a great way to send text reminders to our members to send links for program registration. It has increased our average evening program attendance by 25%. Cons: We have not had any complaints about this program. Great resource! Pros: The ease of use combined with the good value for the money. Cons: If I had to choose something, it would be that messages longer than 30 seconds double the unit cost. Overall: A great service that allows us to quickly contact members with time sensitive information. Pros: So easy to use! I just love the ease with which we can send important messages to all our folks! Cons: After playing with it a bit, it got so much easier!